Check out the great new school page in the GV Australia 2011 school brochure. Are you in it? 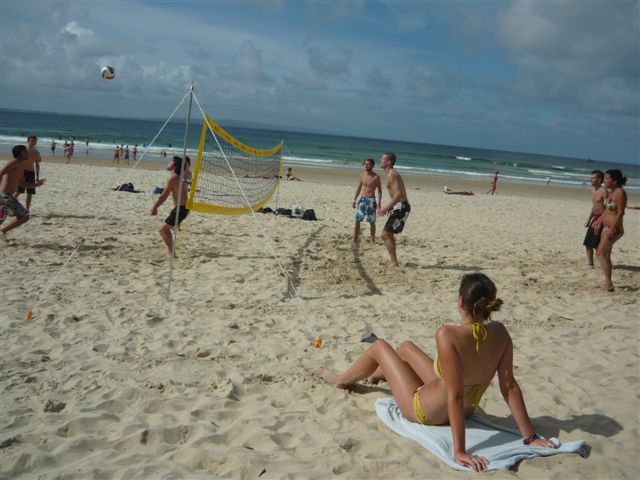 There’s only one Noosa and its stunning natural environment, beautiful beaches and laid-back life style make it a unique study destination. Where else can you see koalas on your morning walk to school then surf in a warm blue ocean with dolphins swimming nearby in the afternoon? Congratulations everybody for doing such a fantatstic job at the Christmas concert today. You all sang and performed beautifully. A big thanks to the Study Tour Group and TAP students from Japan, your performances were outstanding. Also thank you Phil for being a beaut Santa and to all the teachers thank you very much for organising your students with a Christmas song with so little time. the videos taken on the day will be shared and uploaded to youtube in the New Year. 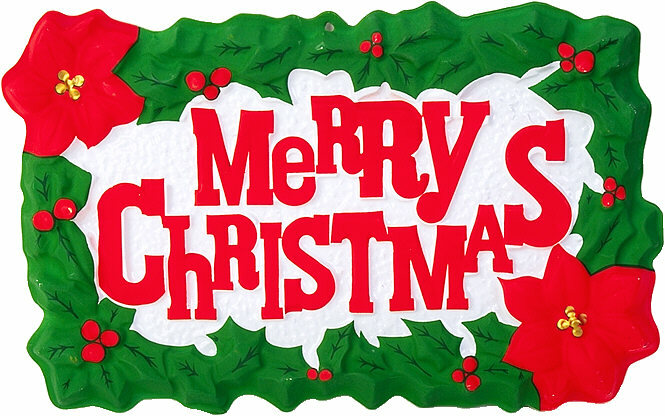 We all wish you a very Merry Christmas and a safe New Year for 2011. DONT FORGET SCHOOL STARTS BACK ON TUESDAY THE 4TH OF JANUARY 2011!!!! NOT MONDAY!!! While teacher Shannon is clowning around these holidays, she wants to wish you all a very Merry Christmas! Shannon, there is no doubt that you are extremely talented and we all wish you a wonderful time with your Mother and family at Christmas. We will miss you in person at the Friday concert, lucky we have a video of you to compensate. Don’t Be Alone This New Years Eve! 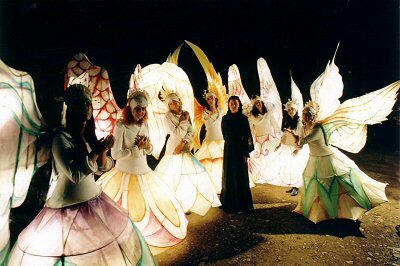 How about joining the thousands who all get together for the annual Woodford Folk Festival. Tribal Travel are arranging a special package for GV students. 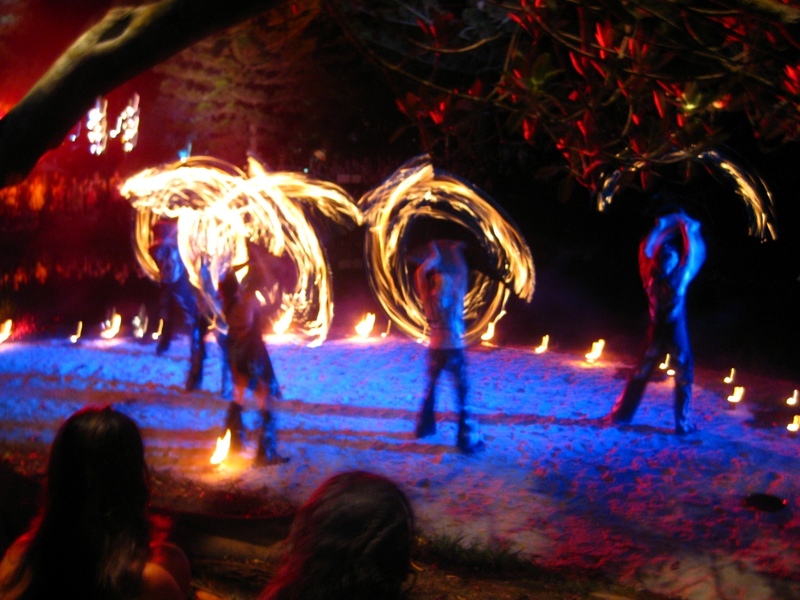 It includes return transport from Noosa to Woodford, plus full camping equipment hire (tent, roll mat and cooking equipment), all for only $55. End of Year Volleyball Game, This Wednesday! 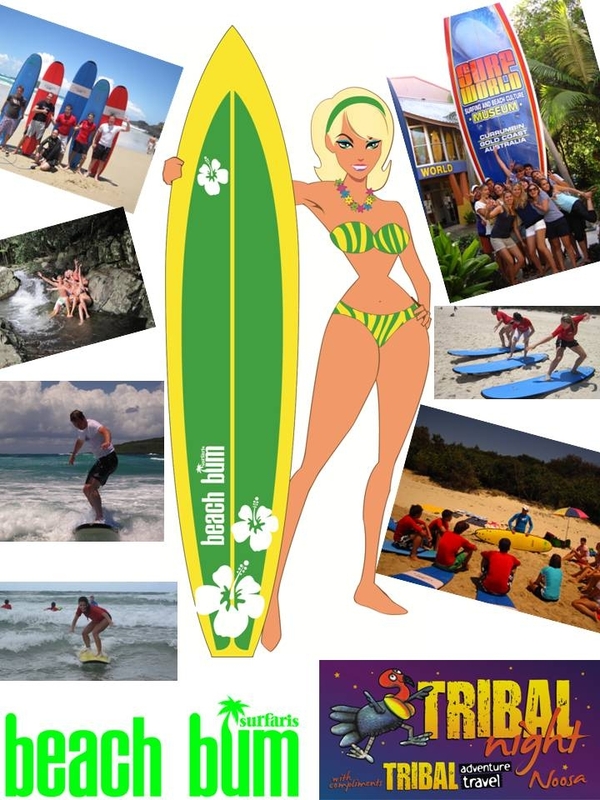 Sun, Surf, Sand, Swim and Volleyball in front of the Noosa Heads Surf Life Saving Club this Wednesday. The game usually starts around 2:30pm but help with setting up the volley net is always appreciated so walk down with Julie and Nadia at 2pm from GV after option class. Last week the teams won a carton of beer and a bottle of wine. This will be the last game before we come back in the New Year so come and have some fun and say merry christmas to your mates down at the beach. Volleyball will continue in 2011 on Wednesday’s, so don’t forget to bring your swimmers and towel to college on Wednesday the 5th of January. Christmas time brings plenty of work in Noosa, so get out there with your resumes and find that special gift for Christmas. Help Wanted – funky New Cafe and Bar. 1 x part time chef 1 x casual chef could lead to full time work. Waitperson – Experienced for Noosaville Cafe. Approx 30 hours including weekends. No night or split shifts. Call 5440 9224 to leave your details. Experienced Chef or Cook – Full time position available must be able to work on weekends. Please phone 0411 754 026. Resort Cleaning Couple Required – would suit a married couple. Experienced ABN 3-5 days a week. Phone 5447 2473. The best way to find a job is to get out there with your resume and take a good look around. Don’t be afraid to say hello to shop people and see if they need some help. Come in and see Nadia at the Activity Desk for some more help with your resume and job assistance. Very special Spanish Guest Jose, came to Noosa 3 weeks ago and is now on his way back to freezing cold Spain. He will be taking home some cherished summertime memories from Noosa, Australia. Nadia the GV Noosa Activity Coordinator with Jose from Spain. Heres what Jose had to say about his time here in Noosa. 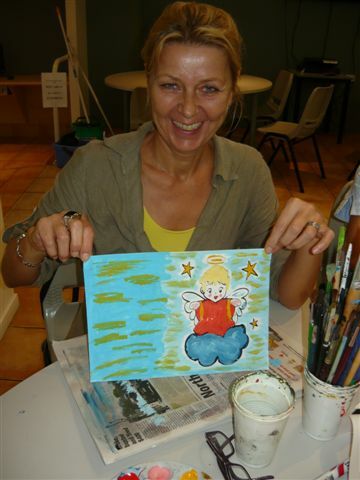 “I have had wonderful experiences at GV Noosa. The staff at GV are really nice and my classmates are very nice. The activities and teachers are very fun. You don’t need to worry about coming here alone because I assure you that you will meet people here when you come and you’re going to have lots of fun. The lifestyle is quiet but there is still people and movement in the town. Noosa is relaxed and safe. If you like beaches and surfing, Noosa is the perfect place for it. the local people are very friendly and kind. My most favourite experience was surfing for 4 hours every day. I would surf down at Main Beach. I tried down at Sunshine Beach but the waves there are not best for a beginner like me, they are better for the advanced surfers. I have seen everything since being here. I have seen dolphins, sharks, turtles, koalas, snakes, dingoes and kangaroos. My host family has been very nice. There is a swimming pool at the home I lived with and it is in a very good location close to the beach and it is just 20 mins walk to the school. I think it is important when you come here to share a house with another student from a different nationality so you can share and use your English together. GV Noosa provides you with this opportunity. 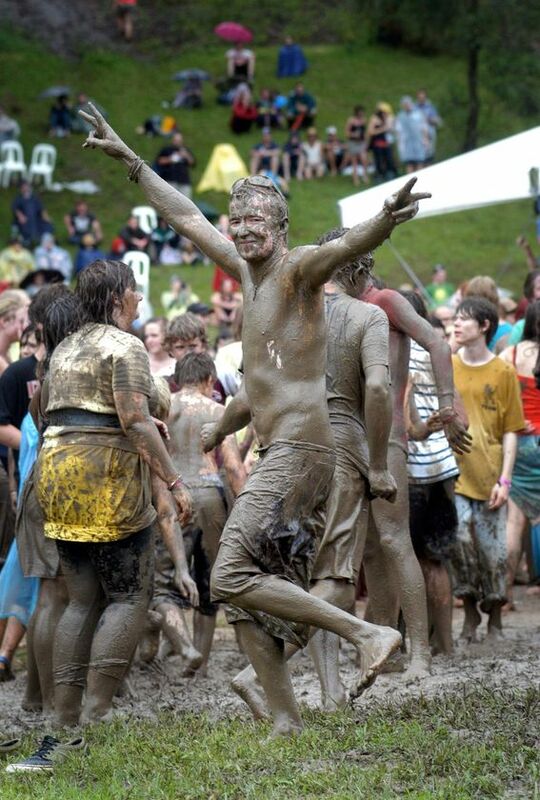 THE PARTY IS AT WOODFORD NEW YEARS EVE!!! Looking for something to do on New Years Eve? 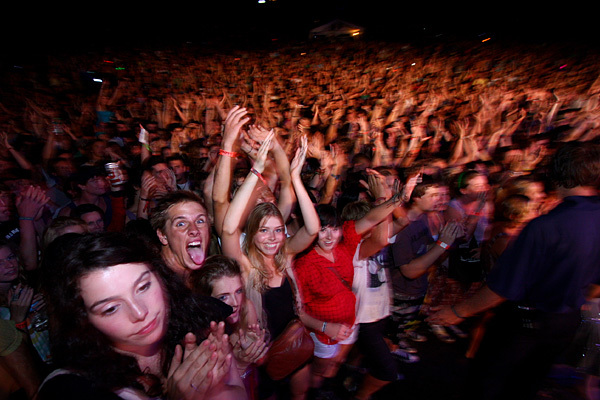 Popular GV student Philipp is being honest by saying that the unique way to enjoy your New Years Eve night is at a major musical festival. 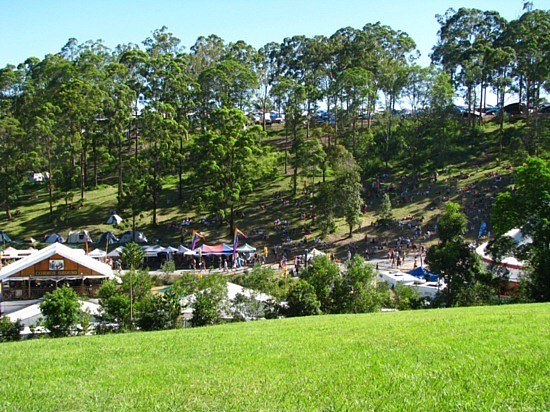 He has done his research and has decided that the Woodford Folk Festival is where the party is at for the coming of the year 2011. 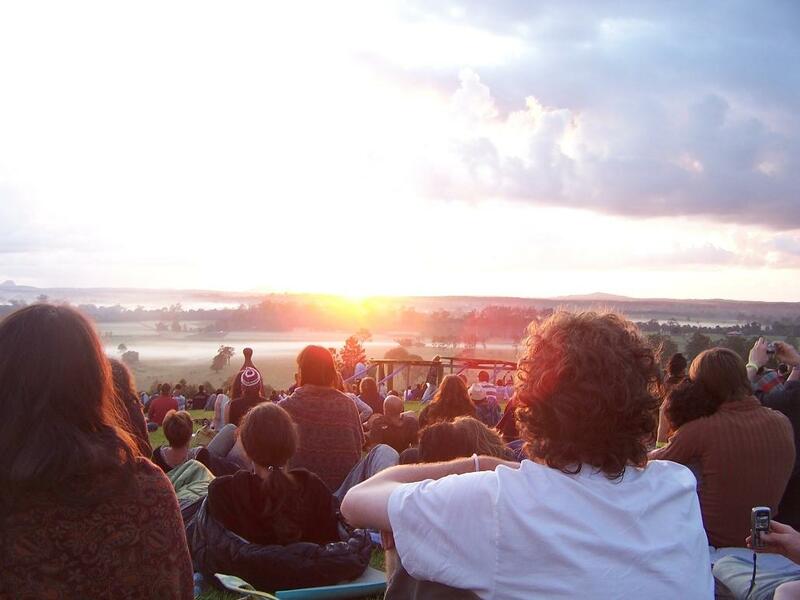 If you are keen to come and join us camp for New Years Eve among many happy music festivilians, go to Tribal Travel and book your seat on the bus before December 23rd!!! Director of Studies Becky Cantor had a wonderful surprise when past student Antonio Bovina returned from Italy to say ‘happy Christmas’. Photograph: Becky Cantor (Director of Studies) with Antonio Bovino. 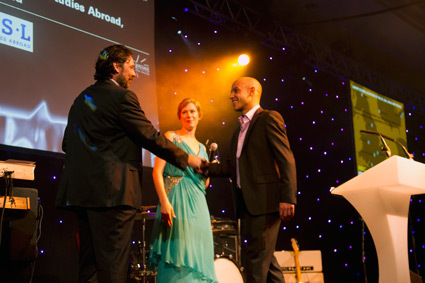 Antonio studied at GV Noosa for eight months. 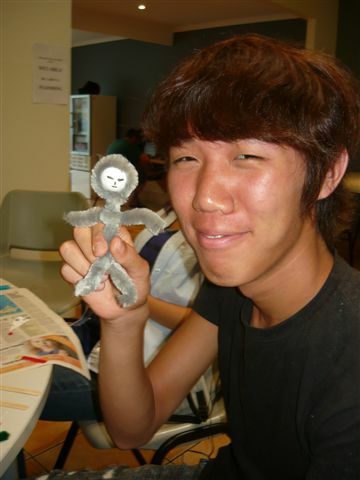 He started out as an Elementary and completed the pre intermediate course. 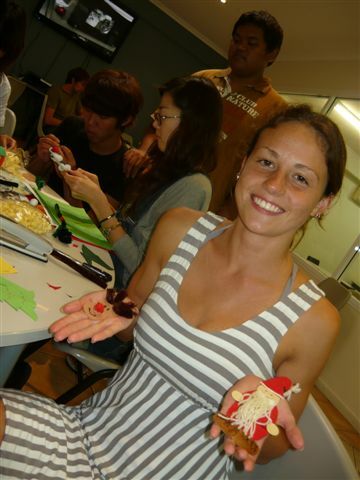 “I could speak nothing when I first started at GV Noosa and now my English is very good. I loved it so much here I had to come back for a visit” said Antonio. Antonio needed English for his bed and breakfast business on the beautiful Almafi Coast of Italy. He says that he gets many visitors from Australia, America and England and good English very important. It’s nice to see you again Antonio. We will visit you in the cliffs of Italy for bed and breakfast sometime! Fa la la la la la la la la or is it Tra la la la la la la la la? Teachers at GV Noosa have combined classes, putting together a very special performance for the Christmas Concert coming up. Today the courtyard shone ever so brightly. 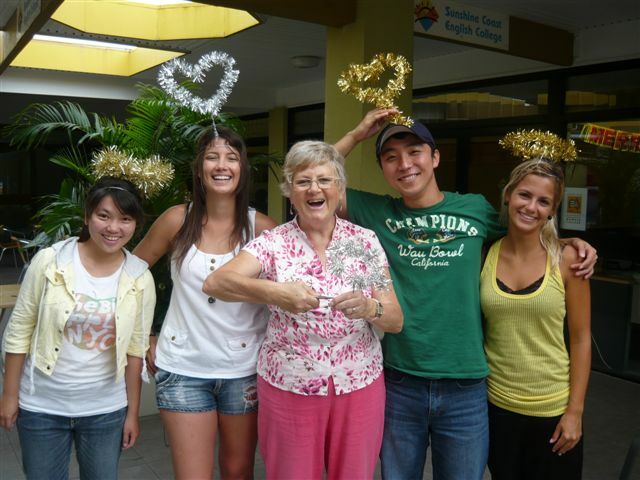 The creative group of Christmas angels were making their halos with tinsel and wire. Santa, his reindeers and his elves must be in the workshop not too far away if the angels are preparing for a big festive celebration. Join the girls from Tribal Travel at Irish Murphy’s tonight! Free BBQ, over $700 worth of prizes to be won, and amazing tunes all night long! The highlight is a chance for you to win a trip with Beach Bum to the Gold Coast, includes….. Surf Lesson (all equipment provided), pick up and return transport from Noosa to the Gold Coast, Surf factory outlet shopping visit, Full Gold Coast Tour, Waterfalls and breathtaking natural Rockslide….. Grab your tickets from Nadia, or in the Tribal Travel Shop, located just around the corner in the Junction…..
Retail Assistants – Casual positions for Pandas Playland and Cafe. role involves customer service, cafe and light cleaning duties. School holiday and ongoing weekend hours. Suit High School students. Energy and flair for the dramatic a must. Prior experience not required but desirable. Part time Retail Assistants – Permanent Part time at Noosaville Aldi. Job Reference No. is STPSASC-Noosaville. Go to aldi.com and click on the smarter Careers Link and follow the prompts. alternatively mail your cv and covering letter to ALDI Stores, Operations, PO Box 3543 Loganholme, QLD 4129. Applications close December 17th 2010. 1x Casual Part Time/Chef/Cook – Potential for full time work. 2x Casual Bar/Waitstaff – Experience essential, need RSA, coffee making experience highly regarded. Barista/Waitperson – Wanted casual position. Experience Essential. Call the Noosa Nosherie on 5449 2147. Wait person – Experienced for Noosaville Cafe. Approx 30hrs plus work on weekends. No night or split shifts. Call 5440 9224 to leave your details. Experienced Chef / Cook – Must be available to work weekends. full time position available. Please phone 0411 754 026. Lady to work Saturday and Sunday – Commence immediately. Driver’s licence, non smoker, tax file number, beachfront home in Noosa. Phone 5448 0772 or 5448 0771. If you need an Responsible Service of Alcohol Certificate (RSA) you can organise with Nadia how to get one. They can be bought online and they are $75. You will need an RSA Certificate if you are wanting to work in a bar to be able to serve alcohol. It is an Australian government requirement for people serving alcohol to have an RSA certificate. Congratulations to our friends at ESL! Many congratulations from all of us here at GV Noosa to the ESL team who were recently voted Best Agency in Western Europe by the readers of Language Travel Magazine. made services for students who wish to follow a language learning abroad programme. Individually prepared for their trip and followed during their course, in this way, the students take full advantage of their language study stay in the best specialised schools” commented Krister Weidenhielm, Director of ESL – Séjours Linguistiques, during the announcement of the results. ESL operates in all major European countries including Switzerland, France, Germany, Italy, Spain, Belgium, Luxembourg, Sweden and the Czech Republic, and currently has students studying at all GV Australia schools. 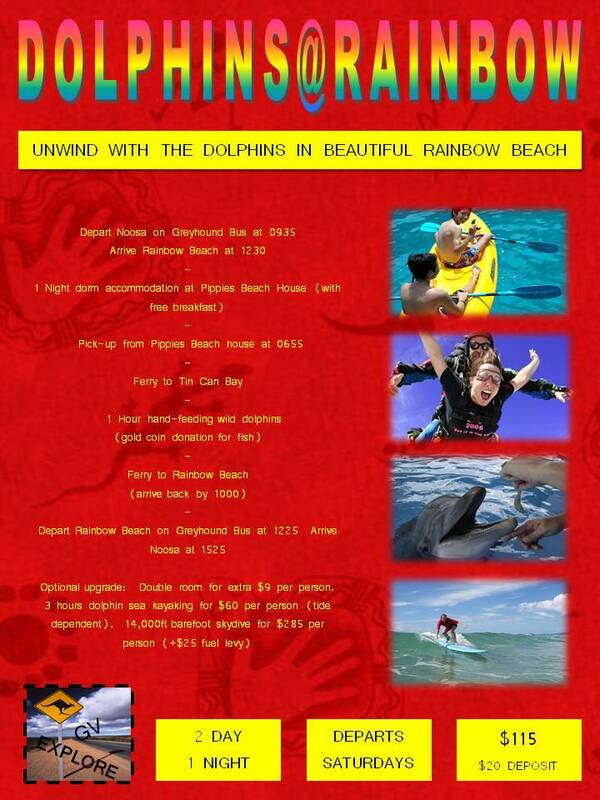 Watch this youtube to increase your chances at winning a free weekend at Rainbow Beach to handfeed the wild dolphins (transport included) at the Monday Christmas Trivia Contest. When the sun shines, the girls and boys come out to play! When ever a group of people are playing volleyball down at the beach you can’t help feeling like you want to get in on the action. It looks like so much Summer fun! So next week come down and join us. The two teams today had to cool off after set one and ran off into the ocean for a swim the weather was that hot. 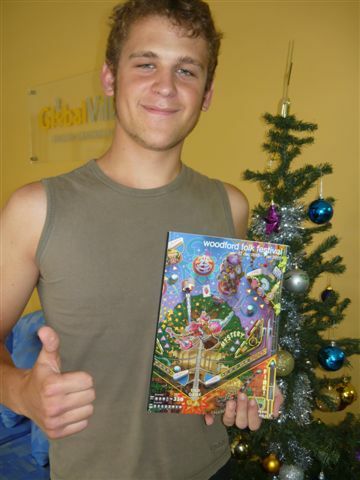 The winning team won themselves a trip to the Woodford Folk Festival for New Years Eve!! 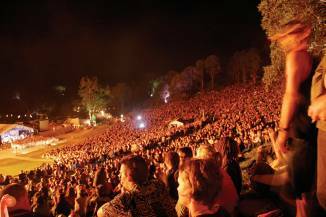 They will set up camp and party in the forest with thousands of people to some of the world’s greatest music and performances for New Years Eve. Next week they will do the same and they are hoping to see more friends arrive in their shorts and bikinis for the Wednesday arvo beach session come along. 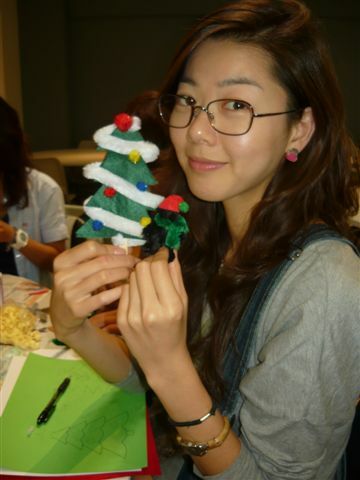 Students at GV Noosa are already getting into the spirit of christmas by making decorations for their families, friends and christmas trees. Sabrina made a santa and reindeer. Sun Bin made an alien eskimo. Teddy made a Christmas tree and a Christmas bear. New student Eva, has made a card to keep by her bed. The fun doesn’t stop there because this Christmas Eve the students and staff are putting together a special Christmas Concert to present to each other before they take a break into the New Year! Everyone is welcome! Tonight there will be chance to win 9 prizes at Tribal Night valued at over $1000. So come along tonight for your chance to win, PLUS get a free burger and chips, yuuuuuummmmmmy! It was fantastic to have such a wonderful group of students studying Cambridge this round. 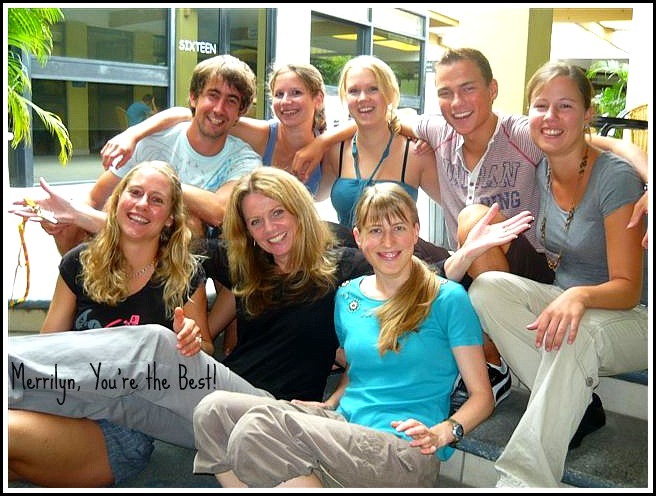 Good luck with your exams and keep in touch with your GV Noosa family through our facebook and blog. Looking for work through Summer? 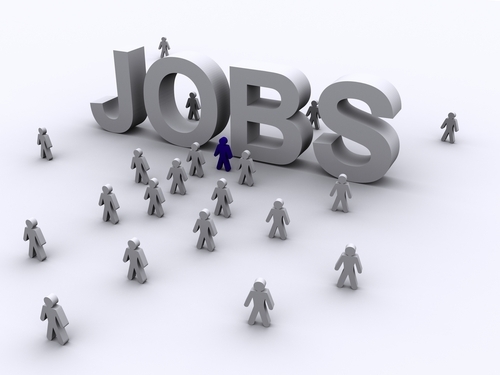 Keep checking this blog on Friday’s for job updates. Full time. Join the team at Coconut Grove Bar Bistro. Excellent working conditions. Email your resume to info@coconutgrovebistro.com or deliver to Upper Deck, 46 Duke St Sunshine Beach. Breakfast and Lunch Monday to Friday. Apply with resume at Fuel Cafe, Arcadia St, Noosa Junction. Wanted for casual position. Experience essential. Call the Noosa Nosherie on 54492147. Experienced waitperson for fast paced environment. Good conditions and hours. Call 5449 7144. Required 4-10 hours per week for a busy family in the Tewantin area. References required. Please phone Jackie on 5474 0127. Immediate start required for an experienced resort cleaner. Permanent half day weekends and weekdays when required. Must be reliable with an eye for detail. 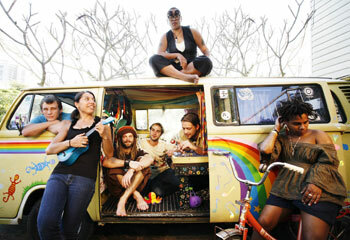 Bring resume into At The Sound 119-127 Noosa Parade, Noosaville. Viridian Noosa Residences, prestige holiday complex in Noosa Heads. Good rates, regular work and ABN prefered. Contact the Manager on 54746700. Must have minimum 4 years fine dining experience. Immediate start Phone 0432 080 799. 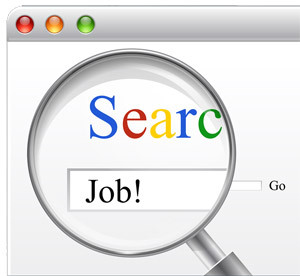 Another way to find a job is to search online. Check out www.seek.com for jobs on the Sunshine Coast. 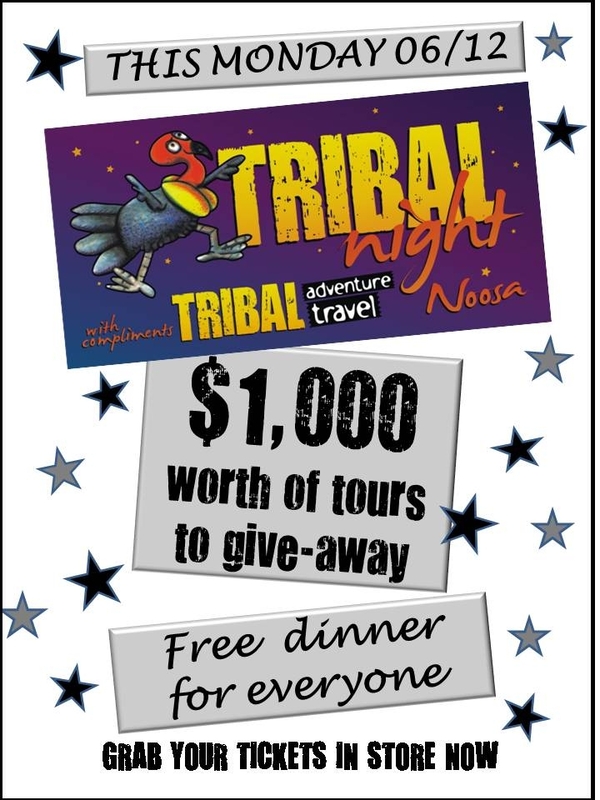 Tribal Travel will be giving away not one, but two, 3 Day 2 Night Trailblazer Tours to Fraser Island. These will be for the Christmas Special departing on the 25th December. 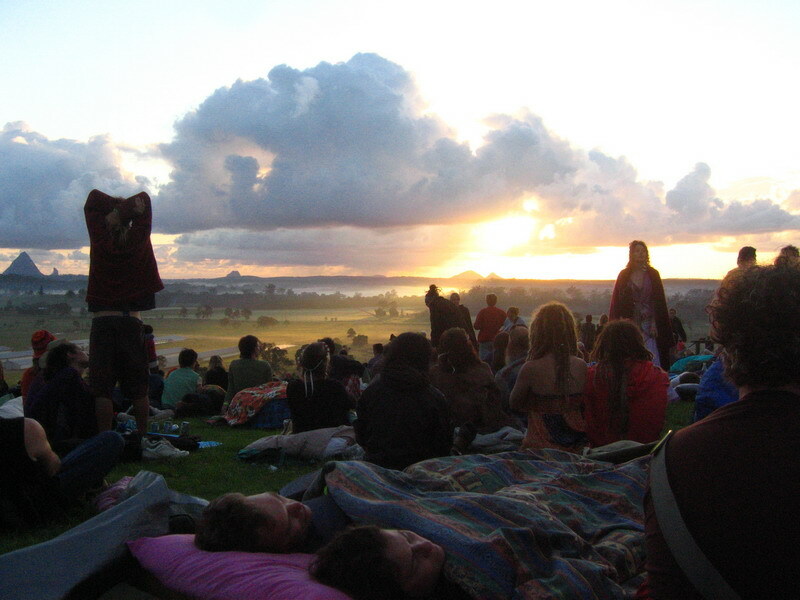 This is a chance of a lifetime to experience a real Australian Christmas while making new friends and incredible memories. Make sure you book to secure your place as there are limited seats available. Tribal Night will still be offering their legendary free burger and chips as well as funky tunes and crazy beats from DJ Tom. Grab your ticket before Monday night from Tribal Travel, ask Nadia for directions if you can’t find them!!!! CPE Teacher Merrilyn is a Superstar! Merrilyn Nagorcka joined the GV Noosa Cambridge teaching team this year and has done so well preparing her students for the CPE Exam, they all think she’s a star!